The independent Disciplinary Tribunal hears and determines all first instance disciplinary cases under the IAAF Anti-Doping Rules or the IAAF Integrity Code of Conduct. The Disciplinary Tribunal is chaired by Michael Beloff QC and it currently has a panel of 54 tribunal members from 35 different countries covering all six areas recognized by the IAAF. The secretariat to the Disciplinary Tribunal is managed by Sport Resolutions, an independent dispute resolution service based in London, UK. This section of the site lists all First Instance Decisions that have been rendered in Athletics since the Athletics Integrity Unit commenced its operations in April. Links to these decisions (where available) can be found in the list of cases below. It should be noted that the Disciplinary Tribunal is a new tribunal and it only has jurisdiction over violations alleged to have occurred on or after 3 April 2017 (or where jurisdiction is otherwise conferred upon it under the Integrity Code of Conduct). Decisions below that are identified as being a 'national decision' or 'CAS decision' relate to cases that pre-dated the Disciplinary Tribunal's jurisdiction and have therefore been heard by the relevant first instance tribunal at national level, or CAS sitting as a first instance tribunal (in relation to cases involving Russian athletes where there is no tribunal at national level). 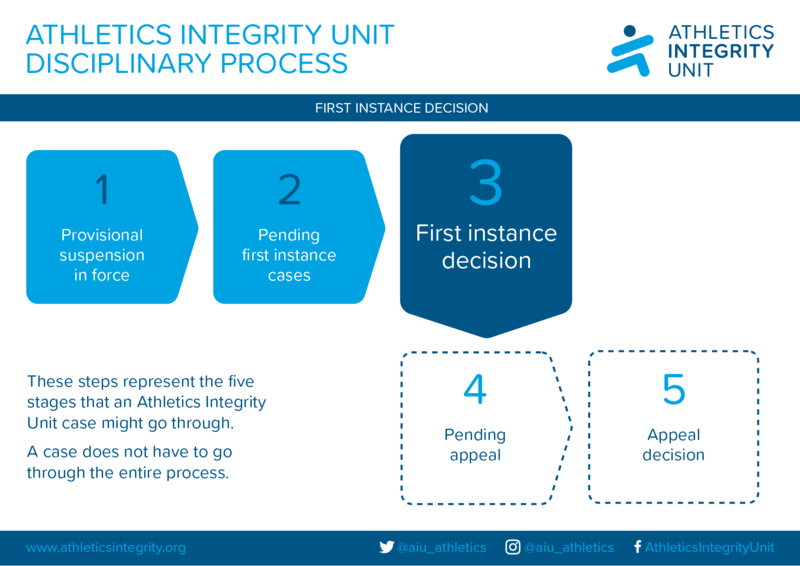 Decisions below that are identified as being an 'AIU decision' relate to cases where the Athlete or other Person has agreed to accept the violation and consequences offered by the Athletics Integrity Unit. Note: Athlete had already served a 2 year ineligibility period for a 1st violation. Note: Athlete was already serving a 2 year ineligibility period for a 1st violation. Note: Athlete was already serving a 3 year 8 month ineligibility for a 1st violation. 16 November 2016 to 15 November 2018. 13 June 2016 to 12 June 2018.